News Is Colin Powell a Compulsive Liar ? Is Colin Powell a Compulsive Liar ?? Claim: Colin Powell talked about the "Mobile biological weapons laboratories". Proffered in the absence of any real laboratories in the wake of the invasion, photos of these trailers were shown on all the US Mainstream Media, with the claim they while seeming to lack anything suggesting biological processing, these were part of a much larger assembly of multiple trailers that churned out biological weapons of mass destruction. FACT: Later it was revealed that these trailers were nothing more than hydrogen gas generators used to inflate weather balloons. This fact was already known to both the US and UK, as a British company manufactured the units and sold them to Iraq. Claim: Powell claimed that Iraq had purchased special aluminum tubes whose only possible use was in uranium enrichment centrifuges. FACT: Both CIA and Powell's own State Department confirmed that the tubes were parts for missiles Saddam was legally allowed to have. Following the invasion, no centrifuges, aluminum or otherwise were found. 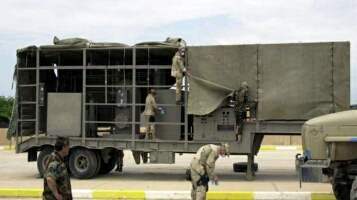 Claim: Powell claimed to the United Nations that this photo showed "Decontamination Vehicles". Claim: Powell claimed the Iraqis had illegal rockets and launchers hidden in the palm trees of Western Iraq. FACT: None were ever found or used. Claim: Powell claimed that the Iraqis had 8,500 liters (2245 gallons) of Anthrax. FACT: None was ever found or used. Claim: Powell claimed that Iraq had four tons of VX nerve gas. Claim: Powell claimed that Iraq was building long-range remote drones specifically designed to carry biological weapons. FACT: a DIA report issued the same time directly contradicted the claim. 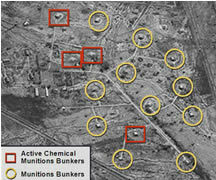 No biological or chemical weapons were found in Iraq following the invasion. Claim: Powell claimed that "unnamed sources" confirmed that Saddam had authorized his field commanders to use biological weapons. FACT:No such weapons were ever used by the Iraqis to defend against the invasion and, of course, none were ever found in Iraq. 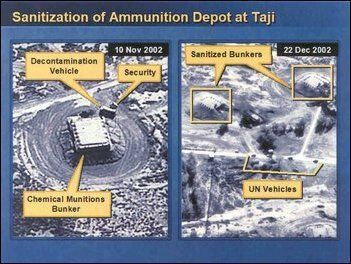 Claim: Powell claimed that 122mm warheads found by the UN inspectors were chemical weapons. FACT: The warheads were empty, and showed no signs of ever having contained chemical weapons. Claim: Powell claimed that Iraq had a secret force of illegal long-range Scud missiles. Claim: Powell claimed to have an audio tape proving that Saddam was supporting Osama Bin Laden. FACT: Independent translation of the tape revealed Osama's wish for Saddam's death. FACT:Nothing in the photos actually suggested what the blobby shapes were and inspections which followed the invasion, all of them turned out to be rather benign. The situation is more like: "Was Colin Powell lied to". Most of the misinformation disseminated by the Bush Administration came from an Iraqi expatriate named Ahmad Chalabi. They paid him over $30 million. He told the the administration what they wanted to hear. Cheney and Rumsfeld were chomping at the bit for a reason to invade Iraq so they conveniently never bothered to check out the validity of Mr. Chalabi's information. Mr. Chalabi sit directly behind Mrs Bush during the last state of the union address. Mr. Chalabi was later arrested in Iraq. Right on the money TSM. More like a muppet with Bush's arm stuck up his arse. I thought he was just being a good company man, but couldn't wait to resign. However, in a recent interview he was still defending the Bush adminstration. After that I completely lost respect for him, and he has lost credibility along with the rest of them. I think Powell will write another book as soon as Bush leaves office. The current administration can make life difficult for a former senior cabinet member who tells the truth. At least that is my hope. It is possible that Powell sold his soul to the devil like the rest of them. Powell seems to have sold out but you may be right. Once the disaster finally ends he may speak out. "Former Aide: Powell WMD Speech 'Lowest Point of My Life." Damn. im am in argentina (yes a corrupt 3rd world country) and even if somenone stole a car for example, and is bring to court, all the papers has to be perfect, any fault in legal process and the case is null, i can't belive the "Most powerfull and prosperous nation on the world" Can start a WAR against a country based on somenthing that looks like a "Chinnese Menu". Yes they where found, and they where were nothing more than hydrogen gas generators used to inflate weather balloons. This fact was already known to both the US and UK, as a British company manufactured the units and sold them to Iraq. So, i am asking now, russ, evo, sid_galt, pengwiuno, or some of those who constantly defend the goverment, what should be done about this? shouldn't colling powel, tenet, and all involved in this be prosecuted? or at least be fired from the office??? what do you think? Powell and Tenet are gone already, but Tenet was presented the Medal of Freedom before he left. I suppose freedom is what it really comes down to here; where else can a few guys get together, dig though a veritable "Chinese menu" of arguments to justify starting war, and acutally make their dreams come true? I'm ashamed of my country. We could be so much better. We do have the power to be a true world leader but we have squandered it through greed and corruption. Yes they where found, and they where were nothing more than hydrogen gas generators used to inflate weather balloons. You know, a hydrogen filled balloon can make a pretty potent bomb. Hmmm .... Let's fill the baloons at Bush's birthday party with Hydrogen then. Classic Propaganda. I don't think so much as that he or the Bush administration was lied to as much as they know the exact facts and lie to the American public in hopes of raising patriotic fervor to support their wars and scare the public with terrorism. The Bush admin hired Jack...might be wrong, kinda forget his first name...Wilson to go to Niger to find out if Saddam had the capability of producing WMD as this was the channel. Wilson came back and reported that Saddam did not have the capability and the next day Bush went on national tv saying that they had new intelligence that he was getting material for WMD from Niger. Wilson was outraged and Rove then outed the identity of his wife, Valerie Plame as being a U.S. spy. This is known as treason and there currently is a lawsuit filed. Also, the Downing Street Memos that the London Guardian put on its front page a few months ago, that has been authenticated by the British Parliament states that Bush knew that Saddam was not a threat and that "the facts and intelligence were being fixed around the policy." The admin also blocked U.N. weapon inspectors from searching for supposed WMD. In Sept. 2000 the Project for a New American Century issued a document still on its website called "Rebuilding America's Defenses". This was written by Rumsfeld, Jeb Bush, Cheney, and Wolfowitz among others. It is a strategy to convince the American public that a war in the Middle East is necessary for political purposes and mainly oil. It states that the American public will not buy a war short of a "New Pearl Harbor type catastrophic event". It then says that they could use this event to get the public behind the war...it lists 62 (i believe) countries to attack. It then says that they can "stage simultaneous theatre wars". Ironically 3 months prior to 9-11, Bush signed WF-199I. This document took all FBI officials off Al Qaeda's trail and killed all investigations. Any agent who was to investigate Al Qaeda would be federally imprisoned. Currently David Shippers, the main lawyer in the Bill Clinton impeachment has filed a RICO lawsuit against the Bush administration with the FBI agents who were taken off Al Qaeda's trail. Also, following 9-11, Bush said that his chief duty was finding Bin Laden and bringing him to justice. Months later he stated that he didn't care where UBL was and that it was not an issue. On Sept.11 and the days following all air travel was suspended except for one flight. This was a CIA flight to Saudi Arabia taking Bin Laden family members out of the U.S. as with Bin Laden's brother who was at a Carlyle Group board meeting in Atlanta with Bush Sr. as the attacks occurred. The Taliban eradicated all the Opium production in Afghanistan and with the U.S. occupation there, Afghanistan is now the world leader in opium production. Also, if you look at a map of newly built U.S. bases in Afghanistan, you will see how these bases lie right on the oil pipeline Cheney wants to build through the region. Also, and I want to say Todd Day or something but I'm sure that name is wrong...anyway a weapons inspector went to Iraq to find WMD. He came back and reported Saddam wasn't capable and Bush right away said they had evidence from his inspection that Saddam had the technology....The very next day Day....if need be I'll go find the exact name and reports...quit from his position out of disgust. The Pentagon and CIA has reported that the invasion of Iraq has now given rise to more terrorists than if Iraq was never waged war upon. While waging a war on terrorism, obviously you need to find Al Qaeda members so on national tv Bush and company announced that they had found terrorist cells in many major U.S. cities. The suspects arrested have all been released due to lack of any credible evidence....The most credible piece of evidence in all the cases was a videotape made of a vacation to Disneyland in Anaheim that had a second still on a trash can. It looks like the Indiana Jones ride to me. It's also been reported that the U.S. pays the Afghan rebels over there for every Al Qaeda member they find. They have admitted that they just kidnap any person that fits the stereotype of a terrorist and hands them over to the U.S. for the profit. They are then sent to Guantanamo or other countries without charges or trial and interrogated. To date, not one person has been charged of having Al Qaeda connections. If anyone wants, I can dig up all the documents and media reports on each or any issue for verification. just ask and I'll go dig them up and post a link. LMAO---champ2823 hit that button to the right of the " every now and again please. Powell---not a liar but rather a tried and true career lapdog. Also, all this talk about Bush and bombs... Shhhh the CIA is hiding behind the O-Scope at the top of the page, and I could have sworn I saw the FBI slinking down the DNA strand a minute ago. Faust...are you saying that what i have said is false? No doubt the CIA and FBI lie about their intelligence as well...My examples are from specific agents hired by the Bush administration for the sole purpose of going to these regions and coming back with information about WMD's. Then these reports were cited by Bush in his speeches saying it was evidence that he did, when the reports are clearly decissive that he didn't. From CNN Presents "Dead Wrong:"
ENSOR: The day before Powell's speech, a CIA skeptic had warned about the defector's reputation as a liar. In an email reply, his superior acknowledges the problem but adds, "This war is going to happen regardless. The powers that be probably aren't interested in whether Curveball knows what he's talking about. Powell was not told about the email. "Is Colin Powell a Compulsive Liar ?" You must log in or register to reply here. Related Threads for: Is Colin Powell a Compulsive Liar ? Why is English compulsory at school? News Powell AND Ashcroft resigning?